Third time’s the charm they say. Thus, this 3rd instalment of Meet The Floggers will round up the saga nicely. Where else to conclude the chapters, but in my hometown of good old Ipoh itself? Since Jason and Citygal were both back in Ipoh for an early Father’s Day celebration (how filial! ), I took the opportunity and dragged myself and Jason over to Gunung Rapat (Citygal’s territory …. not mine. So NOW you know whom to call and ask for help in this area!) for that elusive Yong Tau Foo. OK, slightly exaggerated here, as the shop is in fact, ON the main road, in clear view, but me and KYT missed the shop not once, but twice. Talk about lost sheeps. We might as well audition for a role in Lost; no artificial panicking necessary. Yup, you’re NOT seeing super-imposed images of Yong Tau Foo. They practically stuffed those fish paste into ANYTHING imaginable …. This legendary shop was recommended by Citygal in an old post of hers, and recently mentioned by Alexandra as well. Been in business for a rather long period now, ask any Ipohan staying in and around Gunung Rapat, about that famous yong tau foo (or ‘Liew’, as we Ipohans call them) shop near to Gunung Rapat wet market, and guaranteed most would point you to the right direction. Probably 9 in 10, with the tenth being a blind. The FRIED varieties – My preferred choice, of course. The shop sells ONLY Yong Tau Foo, and a heck of a lotta choices at that. I lost count, but probably in the realms of 20 types? Or maybe more? From stuffed broccolis to baby corns, as well as brinjals and bitter gourds. Pick one of each, and risk over-indulging, which may lead to unnecessary take-aways at the end of your meal. We skipped the noodles, initially, as there were way too many choices of Yong Tau Foo to be picked! But somehow relented, and ordered a bowl of noodle near the end of lunch. Citygal warned, or rather, planned for a second meal back-to-back after this one. So we held our horses and restricted/straight-jacketed ourselves from going crazy at the counter. (Yup, you choose your favourite pieces, then order your noodles and preferred way of serving them). But two hungry (and greedy + gluttony) souls could not comprehend orders that easily. With two bowls overflowing with Yong Tau Foo (one bowl arrived much later due to mixed up in orders … I wonder, who would risk their lives stealing MY bowl?!! ), we proceeded to chomp them down. But without noodles, the experience was somewhat lacking. Citygal recommended the curry noodles with extra greens, in the form of ‘paku choy’, a type of fern commonly stir-fried with belacan, and a staple of Malay cuisine. Weird combination, but worked wonders. Much like munching on kangkung (water convolvulus) in prawn mee. But the slightly ‘kelat’ taste (sorry, no direct translation here) may put some off. 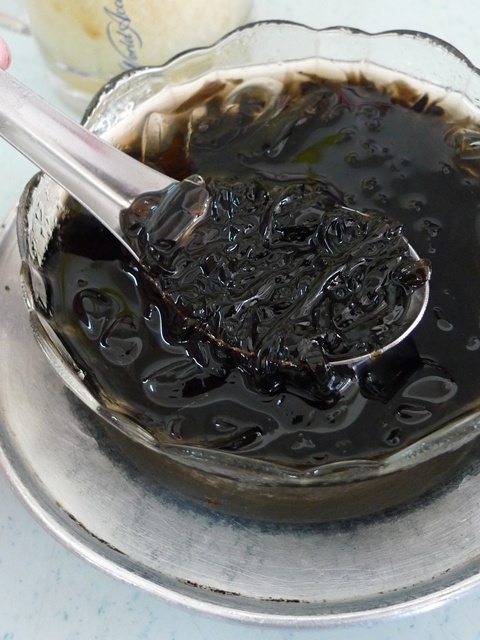 End that meal with a cool, chilly bowl of ‘Leung Fun’ or grass jelly in syrup, or any of their herbal tea of the day. The Water Chestnut drink (‘Ma Tai Kang’) was equally thirst-quenching as well. The meal came to a mere RM17 for all 3 of us. Yup, including drinks. 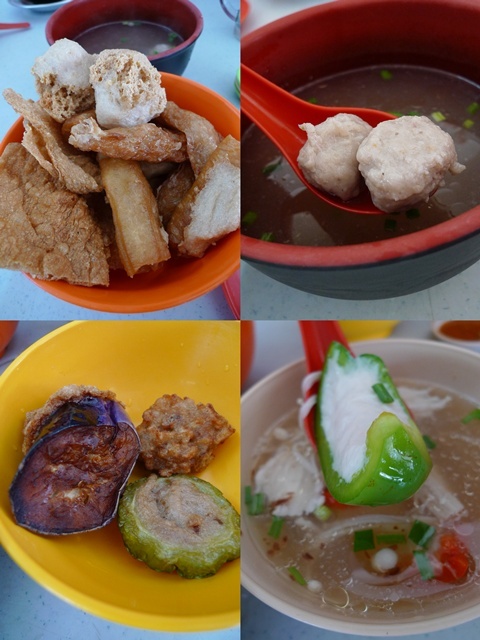 Every piece of Yong Tau Foo costs about 50 cents only. Compare that to Ampang‘s over-rated version at RM1 apiece, and you’ll be chomping yourself over to Ipoh in no time. 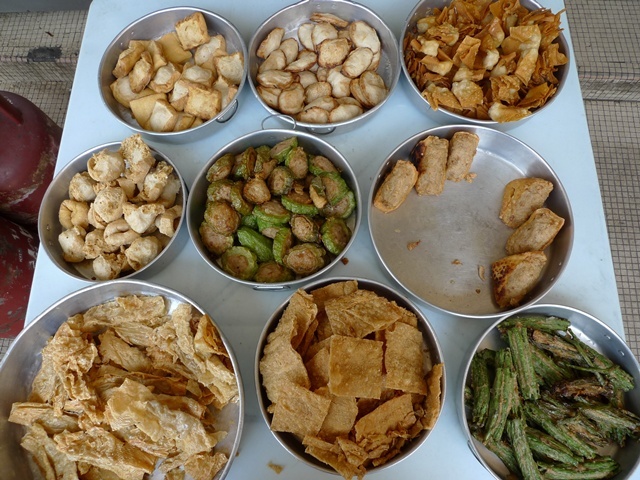 Though I still prefer the Pasir Pinji’s Big Tree Foot’s version myself, as I like my Yong Tau Foo fried. But Kwong Hong is certainly a healthier choice than most. Location : Kedai Kopi Kwong Hong @ Jalan Gunung Rapat, Gunung Rapat, Ipoh. Map at the end of this post. Next stop? A hop and a skip away (but of course, we wouldnt wanna risk dehydration, heatstroke nor falling into auto-napping mode after the meal at Kwong Hong, hence we drove!) is this very low profile, unassuming yet famous shop selling laksa. The renowned Gunung Rapat laksa, for that matter. 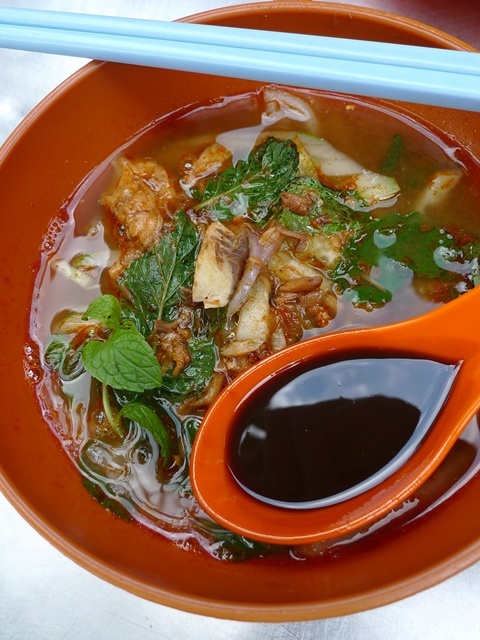 For Rm2.20, you get a bowl of goodness. Tangy, spicy, and yummy. To laksa-lovers, that is. I’m not one who drools, begs my way through, nor hunts specifically for laksa. Not even in Penang, hence you’ll randomly (or maybe never before) see posts on laksa in Motormouth From Ipoh. Each piece @ RM0.50 again. Wow …. inflation clearly has NOT hit this part of Ipoh, yet. But this Kee Poh Laksa (pronounced Kei Poh, not Kai Poh like I initially thought) is so popular with locals and tourists alike, I gotta see this to believe it! Or rather, taste a spoonful of the soup to believe the hype. Comparisons to Penang’s versions notwithstanding, this laksa can be considered delicious in its own right, with chunks of mackerel, onions, garnished with mint leaves and the compulsory (or optional, depends on your likes) spoonful of shrimp paste. But Jason commented the lack of julienned pineapples in laksa nowadays, something which I duly noted in other servings in other states, even Penang. Location : Kee Poh Laksa @ Kedai Kopi dan Minuman Kean Seng, Jalan Gunung Rapat, Gunung Rapat, Ipoh. Opposite the Gunung Rapat wet market. Map to come at the end of this post. 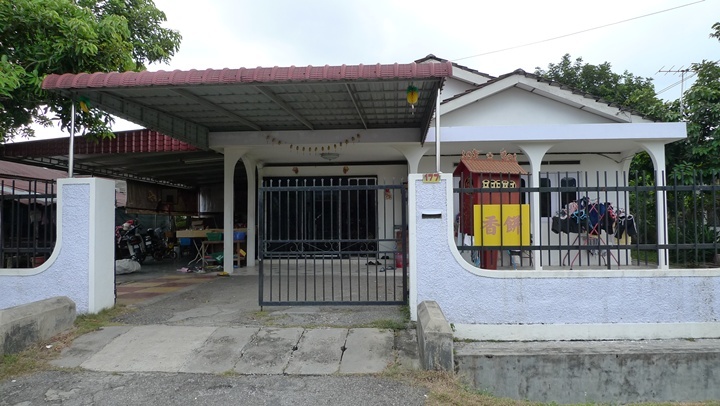 House number 177, Lorong Gunung Rapat 3, Gunung Rapat, Ipoh. What’s hidden in there? Another famous Kacang Putih dealer? When I was small, I was an avid fan of Yee Hup’s Heong Peng. Not the current version commercialized and manufactured by the thousands, but rather, the true, original method of preparing these tasty biscuits; In HUGE clay ovens, ala making naan-style. Then as time went by, Yee Hup grew from sprouts to branches, from branches to trunks. And the old way of baking this Hiong Piah has ceased, making way for modern way of utilizing ovens. But I tell you, the taste is so much different! Though marketed rather well, with people from outstation, even overseas falling head over heels in love with the mass-produced version. Then Citygal miraculously saved the day! She brought us to this house on Lorong Gunung Rapat 3, numbered 177, for she claimed that the company (Seng Kee), STILL makes and sells Heong Peng, the traditional way! Note that Yee Hup’s previous production house (though not sure if they’re still manufacturing them using the original method) is on the same road, in a house numbered 32 (if I’m not mistaken). 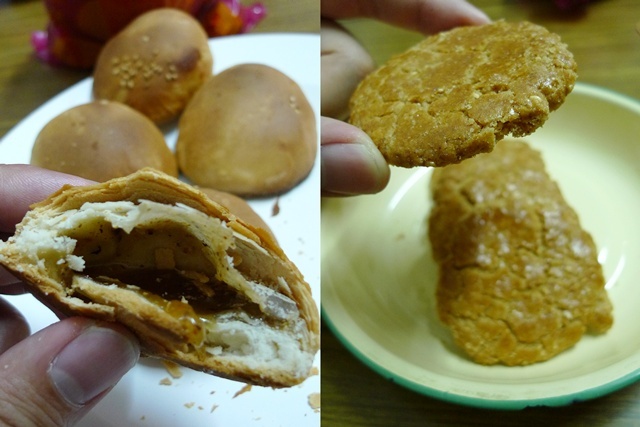 Delicious, addictive and crunchy Hiong Piah … and the biscuit resembling Hap Tou Sou, aka Crumbly Walnut Cookie, but it’s NOT. As soon as I reached home, I tucked into a piece instantly. And memories from days of yore came flooding my palate ….. The coconut husks infused aroma (yup, they used the husks to roast the biscuits inside those clays), the smooth, almost flawless layers of pastry, and the sweet, chewy filling of molasses sugar. Here’s a MAP for all THREE places, combined into one. To get to Gunung Rapat, exit Simpang Pulai toll, and go towards IPoh town. As you pass by Sam Poh Tong caves on your right, go further until you can see the Drive-Thru McDonald’s on the right. Turn right at the traffic lights BEFORE McDonalds with Klinik Bhajan at the junction. You’ll turn into Jalan Gunung Rapat. I've heard many negative comments from critics about Yee Hup's heong peng. In fact, just yesterday my wife and I were wondering if we should hunt around in Gunung Rapat for small heong peng confectioners who are still making them traditionally. Using charcoal and all. Thanks again, Motormouth. We'll try Seng Kee asap. Getting really fedup with Yee Hup ones. It's all hype and marketing now. Gone with the qualities that made Yee Hup a household name in heong peng industry. Sad to hear that those traditional method skill were gone and towards to over commercailised. Sooner or later, our roots become no one recognize for our future generation. I have only tasted Yee Hup's traditional Heong Peng once in my lifetime bt the taste has made a delectable mark in my food memory cell that until today, i still crave for it! The manufactured ones, if u throw it at someone, that person will definitely be hospitalized one! That shows how big the difference is back then vs at the moment…Sigh…. Wow! So cheap the yong tau foo! I wish I can eat those delicious heong peng! Yummy! Wah I super love the zhao liew…. 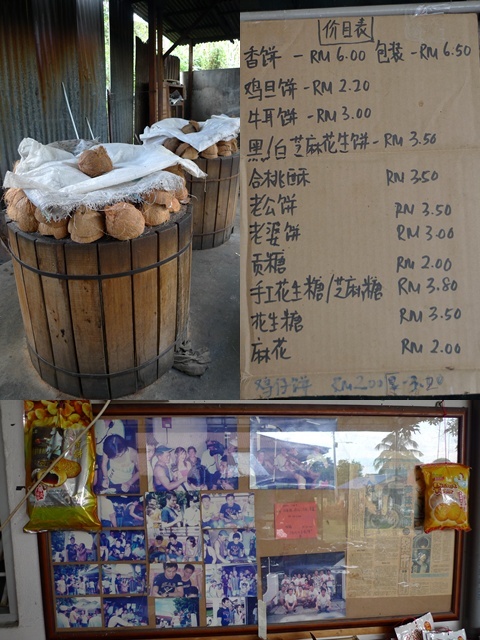 though the one I always patronize when back in Ipoh is the dai shu geok one…. yum yumm! gosh, you are a serial flogger meeter aren't you?? food looks yummy, i wanna makan tour in ipoh too! These places will be in my Ipoh makan list. Like to try out all the mouth watering food. Will definitely be calling you, the makan expert along. G.Rapat is a place i'm very familiar with. I hv tried that "liew" stall but i still prefer the pasir pinji "tai suee keok"! Yes, that heong paeng house produces great stuff – so fresh that usually they dont even seal the packets yet coz the biscuits are still warm! Those Hiong Piah is to die for! I just like to take it hot when they just took it out from the oven. yorrrrr, u lucky one u! always got getogether one! trans states summore! hehe. i'm all for a good cincau on a hot day like this! cheap Yong Tau Foo and crispy Hiong Peah-Gunung Rapat here i come!! Sometimes I seriously wonder if you're blogging from work, you know. The fern got this kelat taste meh? I find it quite ok. I dont actually fancy Laksa but only go for Penang Version. I'm curry mee guy. Nevertheless..the G. rpt version aint that bad. Its already more then 5 years I last visited the stall. Perhaps will go up for my meal again this weekend. BTW, the Big Pau available just opposite the shop & in the market is simply delicious as its rich with ingredients. So much better then the famed KL version. I still like Heong Peah of Gunung Rapat. its additictive snack. there many version..the teluk intan small version or the large sweeter version of Gunung Rapat's. My favourite still Yee Hup though the founding member's educated daughter from States decided to go commercialised. It is still cruncy & rich with fillings. I never like others..Yee Hup for me. Do u know that I have to packed & courier to my friend in US a box of this Heong Peah. He luvs it so very much while here visiting & beg me to courier down 2 boxes..I did just that. It still taste nice & maintain crunchiness. Stanley : yeah, a bit true. if only Yee Hup produces those traditional ones again. gill gill : the hiong peng is RM6 per pack of 10. 60 cents each. mboy : wah, a bit over lah you … hhahaha … but compared to the traditional one, no fight. really. just had my last one. foongpc : hehe, come over for a visit loh. easy … if cannot find, msg me. YiLingL : big tree foot's addictive eh? 50 cents for a big piece of REAL fish paste. Food Paradise : they are popular after all, but it was only my 1st visit. hehehe …. ck lam : makan expert? nolah … far from it. just another rubbish bin. Pureglutton : you've relatives in Gunung Rapat? aiyo, after so many days, i had my last piece just now, and still crunchy! amazing. email2me : yeah! but this one, even cold already still nice! Nic : nolah … hehe, that one over-used liao. cannot win any slogan comp. foodbin : oh they'll be waiting, for sure! hahaha … make sure dont get lost. like i usually do. jason : LOL. don't expose my deepest darkest secret ok? Hulk : seriously, try this hiong peng! the old style of baking them is incomparable. the TRUE version of Ipoh Heong Peng. none come close. last time Yee Hup used to produce such quality Heong peng as well. It's been ages since I last had a GOOD chilling bowl of Leung Fun ! That reminds me hmmmm..perhaps I gonna make this leung fun drink some of these days! In just recent years, I remember Yee Hup Heong Peah were very popular. 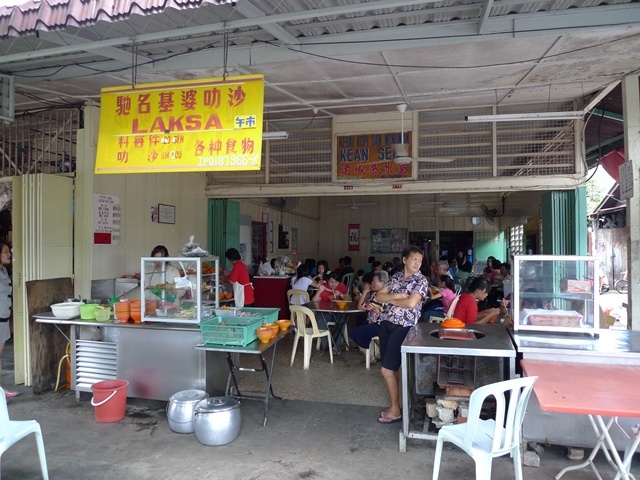 Frequently, there were long queues and at school / public holidays, the queues could grow quite long and customers are limited to just two packets each. Now, with the opening of their factory nearby Taman Song Choon, I rarely see long queues anymore. Now, this business is operated by the three siblings, one of which I know. Sometimes, I've the urge to tell him his family operated biscuit is fast losing its shine. Aiya, how to tell without being labelled a keh poh chee? Hey! Lovely gunung rapat . . . . I was told there is another asam laksa located in a house which is good but I can't find it. do you know? all these places remind me about those days where i worked in Unisem. i often had lunch with my colleagues at the two coffee shops. very nice food…..
been so long since I had heong peng! I have to remember to get some on my next visit! 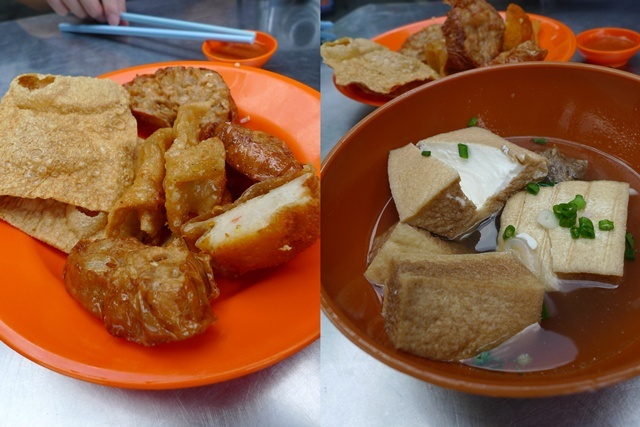 Vege also can yong tau fu… walau eh.. I guess its a must go place again in ipoh…. cariso : perfect for this weather, I assume. Mummy in Vain : oh, you worked there before? yeah, UNISEM's very near to this place. Hazza : but you can find Yee Hup Heong Peng almost anywhere at all in Msia. Wilson Ng : eh, cannot lah, lest you scoop out the fish paste part. but certainly more greens than its counterparts. pak choy & enoki mushroom yong tou fu? What I can say is they are too creative!!! mimid3vils : keng leh?!! I wasnt expecting the greens to be stuffed with the paste as well. ingenious. Not bad your blog, gonna link you! So when I balik kampung I shall know where to eat already!!! Ah, you finally went to Kwong Hong eh! As a rule, I always try to go by 2.30pm before the more unusual varieties of stuffed liew get snapped up. My absolute favourite is the one that resembles a rubbery stuffed ball, but don't let its unprepossessing looks deceive you. Studded with pungent fried har mai, they are so damn good you can polish off a dozen in a blink. 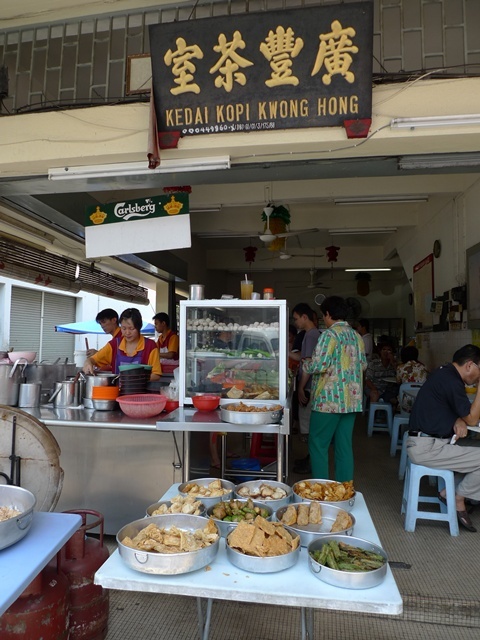 For heong peng, you can also try Keong Kee, just up the road at no 362 (this street is like the mecca of heong peng …). They too bake it the traditional way in those antiquated tandoor-like ovens. Caveat/bonus (depending on your perspective): their best selling heong peng is made from lard. YTF looks damn fresh! 'Healthy' food la, if you don't count the deep fyin! Jester is my nick : thanks, nice to bump into fellow Ipohans here on the blogosphere. Alexandra : yes! i think i ate that. it's fried version right? where's your taman?! and congrats on the launch of Perak Food Guide the other day. sorry wasnt around. hcpen : good thing you're salivating. 🙂 healthy appetite. Cumi & Ciki : one can always pick those healthier versions. There is definately a great different in taste and texture of the heong peng if it was baked in an old method, and the other in a modern electric oven. I still love to buy the traditonal heong peng made in Gunung Rapat than those made commercially like Yee Hup! Just want to say this: No more Yee Hup oven-baked heong peng for me. Stanley : ironically, i just had two of them half an hour ago! and I cant stress enough, how GOOD the heong peng from Seng Kee is. I bought a pack which is still warm, probably fresh from the clay ovens. Got back home and ate one straight away. I've been eating Yee Hup all these time. 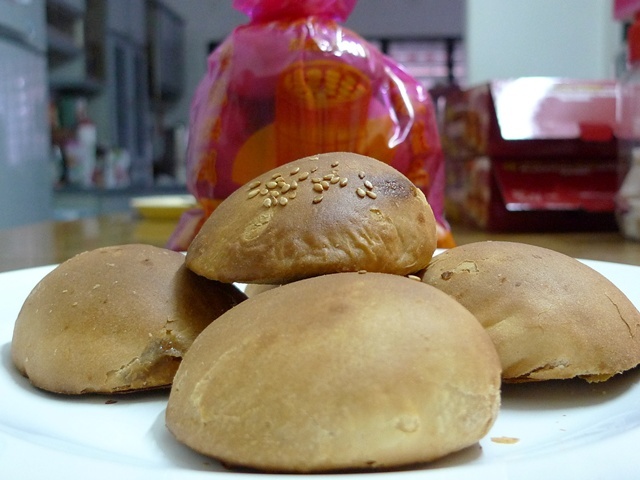 The difference between Yee Hup and traditionally made ones from Seng Kee is so apparent. What a pleasant surprise. Yee Hup made their name through great heong peng but that was long gone. Sure some might still prefer Yee Hup, but for me, hand downs … no more Yee Hup. It's either Seng Kee or other traditionally made ones. What’s the selling price like for the ‘heong peng’? Yes! That one on Jalan Lahat right? Only on Sunday afternoon, hence that has always been on my list for some time now. I will make it a point to write about that the next time I am home. Thanks. The quality of Yee Hup heong peng has deteriorated so badly ever since they began commercialisation. I used to remember way back in the 70’s when they used to bake the heong peng in earthen ovens heated by burning coconut shell and coconut fibre. All is now lost in the name of large scale commercial productions and fat profits! 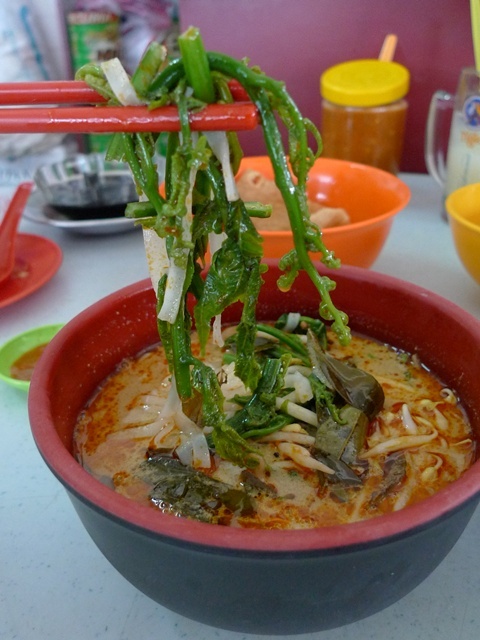 The original Kee Poh Laksa @ Gunung Rapat, have recently re-open again at a new location. The new stall is in a coffee shop name, Restaurant Gunung Rapat Tong Fong. It is just beside the wet market. I live around the corner so Kwong Hong is a regular go-to place. On my last visit in March, I sat at the table in the front, by the food preparation area. What I witnessed next made me vow never to go back! I saw the staff pick up a piece of food which has dropped on the floor and put it back onto a customer’s bowl. I raised this with the owner and he just shrugged, seemingly to indicate there’s little he could do if his servers have bad food hygiene practices. He finished off by telling me it’s not for me. I don’t go there anymore.